Vinyl banners are digitally printed in full color using the CMYK color mix. Some colors will look good on your computer screen, but they will print differently. 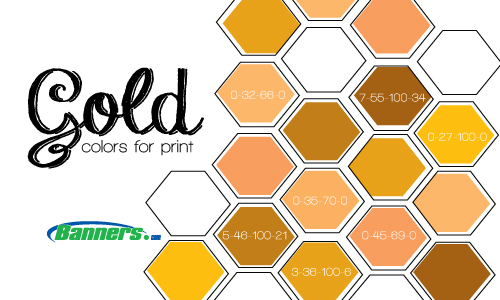 Gold is one of the trickiest colors to get right for digitally printed banners, so we've put together some of the common gold color mixes that print correctly. We recommend using one of the color mixes below when you design your files in Adobe Illustrator or Adobe Photoshop.